The artistic creation of Lidó Rico in recent years can be defined by surprise, drama and irony. But these aspects are only the means of transcending to a higher reading. His work is committed to universality through metaphor. The scenes of torture, cruelty, desperation, death and unease are allegories of a society in agony. The resin sculprures are transformed into icons of human behaviour; the masks, the multiplicity of faces or the faceless individuals are symbols of hypocrisy, the complexity of the mind and the lack of personality. Irony plays a fundamental role in all this, as it attenuates the aggressiveness, allowing the spectator to reflect on human existence. explicitly through the feeling of guilt of the torturers, murders and torments, in this exhibition the gestures of terror and desperation are motivated by existencial anguish and the obsessions that corrode their souls. When studying the work of Lidó Rico the technical process must not be overlooked. The pieces are fruit of the immersion of parts of his body in containers full of fresh plaster. This action allows him to shape a mould that is then filled with polyester resin. To obtain different-coloured pieces he adds dyes to the resin before pouring it. When the material sets the piece is recovered from the plaster. 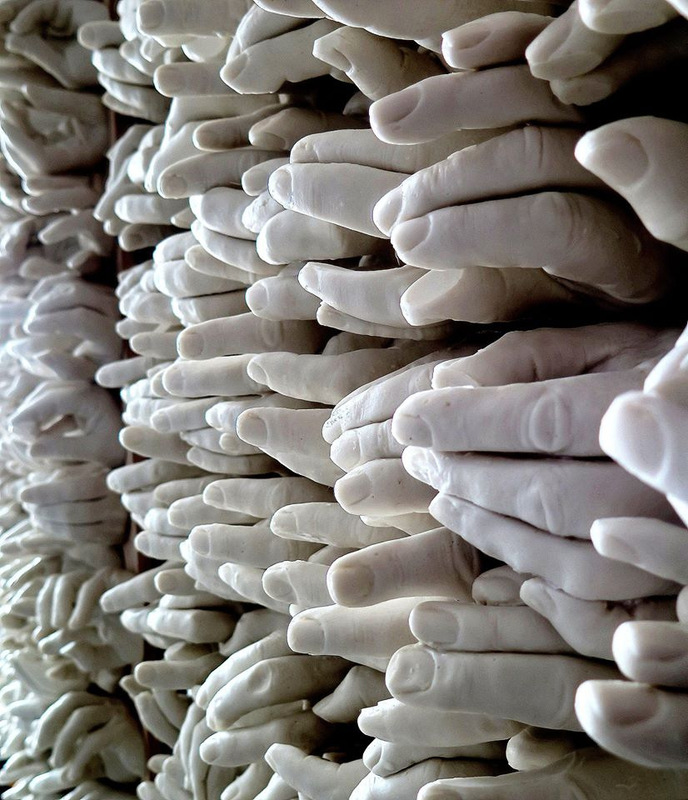 The mould may occasionally be made of wax or silicone. Once the raw sculprures have been obtained, they must then be sanded clown. As well as sanding away impurities and hiding small cracks and pores, this process allows the details of the scultrure to be defined and a delicate texture to be achieved. The final step consists of rubbing oil over the pieces, giving them a shiny appearance. Despite the technical control shown by Lidó Rico in his work, the creative process and the materials he uses tend to express themselves. The sanding work normally attenuates the abuses of the mould and the resin. But he occasionally takes advantage of these abuses, preserving them in the final result of the work. In La Biblioteca de la Felicidad, one of the characters is wearing a bathing cap. It is the cap that Lidó uses to protect bis hair when he submerges himself. It is normally barely defined, but this time it appears clearly in the sculpture. The case of the figure of La Señorita de las Cuentas is more surprising, as it is the only one where the eyes are open. The effect is accidental, as two pores drill through the material, outlining the pupils perfectly. In these cases, chance is fundamental to the feeling of unease. Despite the work of Lidó Rico being within the parameters of the most modern art, it is also true that it shares aims and resources with the Baroque. Broadly speaking, baroque sculpture seeks to have an impact on and move the spectator y using different procedures: creating the sensation of movemenr, overload the work to unsuspected limits, break the limits between the space belonging to art and that belonging to the spectator or capture the most dramatic moment of the action. All these resources can be seen in Lidó Rico’s work. To achieve the illusion of dynarnism, he uses different strategies such as diagonal composition, deformation of the face caused by speed, capturing objects in free fall or the fierce contortions motivated by mental and physical agitation the characters have to undergo. For example, in (The I.ibrary of Happiness), (The Voyeurs) and (Self Portraits with a Red Box) Lidó Rico has resolved the diagonal composicion, thus intensifying the dynarnism of the scenes. In (The Voyeurs) the attraction of the characters towards the television causes the face to deform, thus accentuating the illusion of movement. The vast majority of the figures have also been captured in action, although some stand out above the others: ln The Factory a character is manipulating spheres and one of them is frozen halfway through its fall. However, in this sense the most striking piece is L ‘Homme Oiseaux (The Bird Man), where a figure raises the top of bis skull and the brains gush out. Lidó Rico’s magic consises of freezing the moment to make it eternal. commotion. The Factory surprises the spectator and becomes an enormous altarpiece of disquiet. (Ihe Great Banquet), the basin placed on the floor from which emerges a head, provokes rhe interference of art with rhe sphere of the visitor. The television table in Los Voyeurs and the bottom row of desks in The F’actory are at the same time anchored to rhe wall and supported by the floor, meaning that hey function as a nexus. relationship between the space belonging to the sculpture and that belonging to the spectator. Is aggressiveness something that annuls beauty? At the end of the nineties rhere was a major change in Lidó Rico’s career, when he moved on from works oveflowing with lyricism and delicacy to pieces full of aggressiveness and pain. Gloria Moure, in rhe catalogue of the exhibition The Sowerfighter, refers to this evolution and comments: “I must confess, however, that the anthropomorphic, violent change of course set by Lidó Rico in his latest works has shocked me deeply”. glass produce the effect of being aromatic and even edible. The small flask brings to mind the works of the early nineties where Lidó Rico inserted resin fingers in fragile glass containers. In Imposición (Imposition) and El Gran Banquete (The Great Banquet) he combines yellow and fillite in perfect balance. In the former, the yellow masks are superimposed on the fillite and the colours are perfectly faded thanks to the sanding work. In the latter, on top of the dark grey we have the striking yellow of the head that is being devoured and of the liquid in the bowl. one of the figures handles prisma tic parts from a building game, another has dropped a multitude of small hemispheres that are scattered over the desk and in four sculptures a highly stylised elliptic volume is superimposed on the face. Lidó Rico’s work of recent years is unquestionably highly violent but, when one looks closely, we realise that beauty has not disappeared beneath the cloak of unease and that care for that wich is aesthetic is still latent des pite the dramatic nature of the theme. Lidó Rico’s creations have always been imbued wirh a halo of causticity, but in recent years sarcasm, combined wirh the violence of his proposals, has created an explosive cocktail of social criticism. the strong dose of sarcasm, amusement manages to displace aggressiveness from the scene. In Lidó Rico’s work there is something hard to pin clown, something deeper and more intense, something that imposes itself on the spirit wirhout passing through the filter of reason. There are disturbing pieces that one can become obsessed with. Aggressiveness, unease and anguish move unnoticed towards the spectator: on reaching this state, one really appreciates -the force of his sculptures. The visitors navigate through the labyrinth of the exhibition hypnotised by rhe siren song. The attractiveness of Lidó Rico’s work drags the new Ulysses towards the rocks of perturbation. FRAGMENTS OF EXPERlENCE. INTERNAL AGONY.